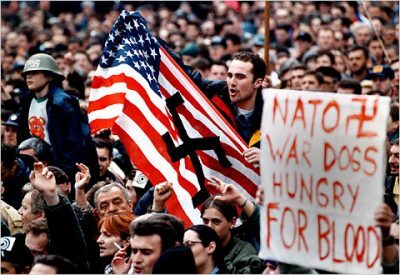 Once again this March, the Belgrade Forum for a World of Equals, the Club of Generals and Admirals of Serbia and other independent non-party associations in Serbia pay tribute to the victims of NATO’s 1999 aggression on Serbia (FRY). This aggression took lives of more than thousand defenders, military and the police and their officers, and also of thousands of civilians, including 87 children. Regrettably, the final list of the civilian casualties has not been determined as yet, although the number is estimated to stand at over 3,000. About 10.000 people were wounded. However, the number of those who lost their lives after the end of the aggression due to sustained heavy injuries, or from unexploded cluster bombs, chemical poisoning that resulted from the destruction of refineries, transformer stations, chemical factories and, in particular, due to the delayed effects of the use of missiles with depleted uranium, most likely, will never be precisely determined. There is a certainty, though, of a large scale of victims of the cancerous diseases never heard of before the aggression, with no end of the suffering of the people at sight. The direct damage from the devastation of the industry, infrastructure, residential buildings and facilities of public importance, was estimated to exceed $ 100 billion. 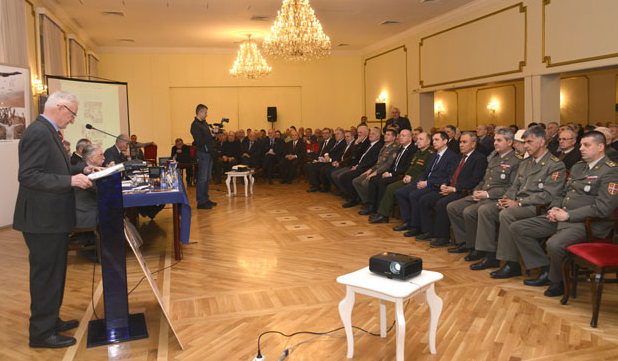 This year, March 21st the Central Military Club of Serbia in Belgrade served as the venue for the Conference titled “NATO Aggression 19 Years On – Aggression Continues”. Among the guests were General Aleksandar Živković, State Secretary in the Ministry of Defense, Colonel Iriškić, of the General Staff of the Serbian Army, Ambassadors of Belarus Valery Brilov and of Palestine Muhammad Nabhan, representative of the Embassy of the Russian Federation Colonel Koronyenko, as well as representatives of other embassies of friendly countries, and colleagues from Montenegro, the Republic of Srpska, Germany, Macedonia, and others. 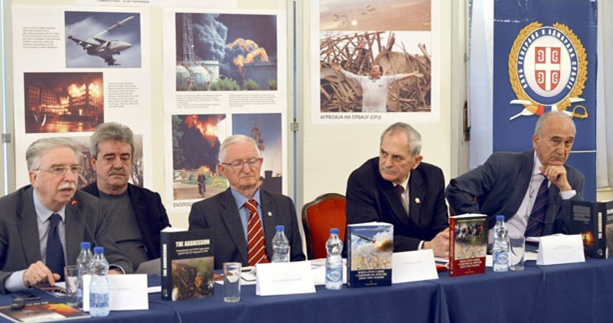 The Conference was also attended by about 150 members and friends of the Belgrade Forum for a World of Equals and of the Club of Generals and Admirals of Serbia, including three former Chiefs of Staff of the Army General Branko Krga, General Dragoljub Ojdanić and General Miloje Miletić. “In order to justify criminal act of aggression and preserve Alliance’s credibility they invented our apparent crimes. They created exodus of Albanians falsifying justification for the bombardment. For those who are open to see the truth this has been proved even in Hague tribunal”- said Bulatovic. President of the Belgrade Forum, Živadin Jovanović, said that to talk about NATO aggression today means to talk about gross violation of the international laws, the UN Charter, the Final Act from Helsinki, and the Paris Charter. By circumventing the UN Security Council, NATO has created a precedent using it later on for a chain of other aggressions in Afghanistan, Iraq, Libya, Mali and other countries. Such a practice has led to the globalization of interventionism and destabilization of the entire planet. This was not the most severe blow to the European and the global security system, from which neither Europe nor the world managed to recover to this day. Jovanović pointed out that, in the meantime, the NATO aggression has evolved from its military format into other forms, all having the same goals: stealing Kosovo and Metohija from Serbia, drawing new international borders, creating a new Albanian state on a part of the state territory of Serbia, and dividing the Serbian people to those south of this presumed new border making them to be yet another national minority, and to those north of the border remaining in the central Serbia. Attempts are underway to coerce Serbia, with pressures and threats, into collaboration in this geopolitical project by having her refrain to oppose the admission of this illegal construct in the membership of the United Nations. The form is – signing a “comprehensive legally binding document” particularly advocated by Germany. The aggression continues also by telling Belgrade that “none has the right to veto the creation of the armed forces of Kosovo”, regardless of the territory of the Province of Kosovo and Metohija still being under the UN mandate. The two-year timeline for the ‘delivery’ recently set for Serbia by the EU European Commission, the USA has subsequently reduced to a year, thus demonstrating its dissatisfaction not only with the pace of ‘delivery’ but also with the inefficiency of the European Union. Zivadin Jovanovic is the President of the Belgrade Forum for a World of Equals. He is a frequent contributor to Global Research.